I’ve painted a whistling kolobok and filled it on FTP. I looked at it and realized, that one can whistle in different situations. That’s why I decided to draw other koloboks with different emotions, passing to whistle. I think it is the right way. All the whistlers you can find in the section for Standard smiles. Today is a productive day, I’ve painted four smiles more. (A long time ago I promised INF to paint one smile for QIP, but I painted several of them.) I tortured myself thinking: "Which one must I delete? Which one should I leave?" But then I thought: "Why am I torturing myself alone? Let the others think and torture!" And left everything. Here you are! Of course they are similar, simply use the one you like more. I won’t tell what this or that kolobok means, because it’s useless. You will decide yourself, where to paste them. But don’t work too hard, I’ve heard, that some admins don’t want to install koloboks on forums, because according to them it disturbs the communication. If there is a couple of koloboks in the post, all attention is given to them. The message loses its sense and the post becomes colorless. It may be not literally what they say, but the main idea is clear... And how do you like them? 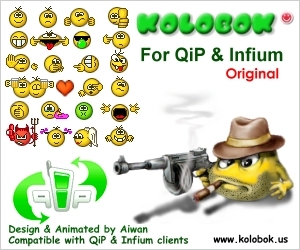 A new set of smiles for the new growing in strength and popularity internet pager QIP - KOLOBOK For QiP. Original appeared. This set includes two folders with animated smiles, one for the dark background, one for the light one. Smileys for the light background are a little bit changed, namely I added a bomb and a rose to the standard set, which I couldn’t paint for alpha-release QIP. To download this smiles you should change all pictures in the needed skin by you and restart the client. Render time: 0.1327 sec, 0.0042 of that for queries. DB queries: 21.